Johnny (Robert Reed), Betty (June Kenney), Jeanne (Joan Lora), and Pete (Eugene Persson) are teens out on a boat trip who decide to visit a nearby jungle island while their ship captain is passed out drunk. What they find is a hunter by the name of Dr. Balleau (Wilton Graff) and his cadre of sailors/thugs. After dinner, Balleau reveals his plan: hunting the intruders with a crossbow before putting them on display in his trophy room. Bloodlust! is the story, “The Most Dangerous Game” by Richard Connell, but in this case, geared towards the teenage drive-in market of the late 1950s. Every character is a very basic sketch of a human, we have the hunky All-American male, the nerd with glasses, the tomboy, and the random 50s girl who isn’t much good at anything. None of the adults can be trusted, when the grown-ups aren’t actively trying to kill someone they are lying and cheating to get their way. Toss is some unusually explicit gore and a running time of barely over an hour to fit nicely on a double bill and you have a guaranteed money maker. "Mr. 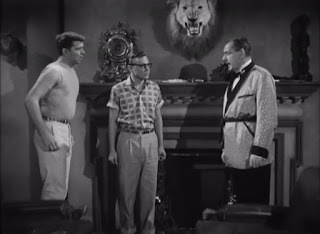 Lion and I both know you are sucking in that gut big-time, Mike Brady." 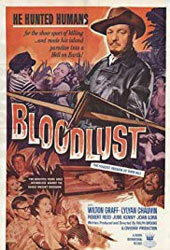 It is pretty easy to dismiss Bloodlust! outright for its paper-thin characterizations, alternating overacted and wooden performances, and simple plot (MST3K’s savage attack on it, didn’t do its reputations any favors either). Indeed, it is a cheap mess of a film, but it posses some quirks and details that make it more interesting than you would expect. 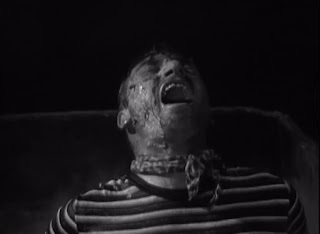 The gore on display is notable for the period when the movie was filmed (1959 but not released until 1961). Bloodlust! shows off gruesome corpses, crossbow bolt wounds, severed body parts, impalement, and acid dissolved faces with an abandonment that lifts it out of the predictable thriller that it is. Not only is it delightfully lurid but it gives a palpable sense of danger to the proceedings... that movie sadly neglects to capitalize on. It also interesting to see a genre film from this period send off two women on their own and not reduce them to victims. Betty is established as a judo expert early on, something that pays off in perhaps the most satisfying scene in the film. Both Betty and Jeanne end up being resourceful and possess agency throughout the story. "Oh, this acid bath is really clearing up my pores...and everything else." If Bloodlust! has a single fatal flaw, it is in the character of Balleau. Wilton Graff gives him a certain cold charm, but he is saddled with some truly terrible dialogue that is supposed to demonstrate his murderous intelligence but instead makes him sound like a stupid person trying to sound smart. Bloodlust! has a lot of problems, but it also has a few surprises to offer that make it a short and interesting journey into a low budget hybrid of thriller and horror. At sixty-eight minutes long and in the public domain it isn’t a difficult film to hunt for and you might just like what you find.